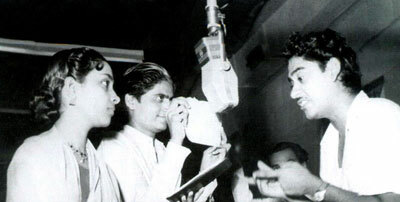 Kishore Kumar » Blog Archive » Kishore and Geeta – the two melodious greats! Home » Kishore diary » Kishore and Geeta the two melodious greats! Kishore and Geeta – the two melodious greats! From Marcilo Ohio’s personal diary leaves – Here is about the melodious duo who gave some of the most memorable ‘zara sa hatke songs’ even though they belonged to a time when such songs were not accepted! Geeta Dutt and Kishore Kumar, just think about this combination. Well well..some one can say, nah don’t even bring that up. How many do they have together? Just 13, is that what the count is? What you gonna be writing or discussing about it. This ruffles dust sitting atop management related discussion narrated in one of the top business schools. Discussion in the class was to sell shoes in sub Saharan African country. Well no one in that area wore shoes. So one management aspirant said, nah, can’t do. Other said, wow, what an opportunity, no one wears shoes there what more can one ask for. Same goes here too. One might just pass duets by these two singers altogether but hold that thought. Just listen to them, if not all then how about, half ticket song or song from Jaalsaaz. One really has to ponder after listening to these two songs what they really bring to the ever growing wide spectrum of Hindi film playback singing. Just consider a band in this spectrum that deals with nook jhook or discussive singing so to say. What does one feel after listening to these two songs? Doesn’t one get feeling that this genre is home to them or they are primitive constituent that forms this very band in this spectrum? Thinking that this is one really easy genre will be transgressional. No, it’s not easy. Giving a smooth ride wave form or a tot’s slide to a debate is never an easy task. Listen to oomph in her voice when she sings.. aakhon mai tum… maano ke na maano.. Voice holds seduction and can beat “the” best Merlot of Bordeaux any day any time. Kishore compliments by his mischievous sarcastic laughter by saying,….. hee hee heee kab se yeh dil tumhara.. jaano ken a jaano. Together they brought life and gave new dimension of nook-jhoonk singing. How can one best define nook-joonk but for this. This is it, it doesn’t get any better. They had that chemistry to do it. Don’t get me wrong, it’s a great song but compare above song to lyrics of …jab jab tujh ko chhuha … jaise koi eek baar chu le bijli ka taar.. current current… …. What made former sail through and latter get entangled in realms of mighty Censors? Did this song cross that seductive limit? What made this song to be one that had far extending Roche limit by any means? A fear that grappled censors that this has far extending roche Limit. It wasn’t in lyrics, it was in singing and that is the underlying reason. It was how that was presented. It all comes back to one thing, Seduction is in the Voice. This entry was posted on Tuesday, August 4th, 2009 at 10:49 am	and is filed under Kishore diary. You can follow any responses to this entry through the RSS 2.0 feed. You can skip to the end and leave a response. Pinging is currently not allowed. 1. O bewafa yeh to bata luta chaman kyun pyar ka. Pyar(1950): An unlikely Kishore-Geeta duet where they express complaint between each other for a broken relationship.. Great song with great pathos..
2. Sundari lo sundari. Samar(1950): Great song with Arun Kumar as the third singer…. Full masti and both Kishore and Geeta at their best!! 3. De bhi chuke hum dil nazarana. Jaal(1952): What happened to Kishoreda here?? I mean, was he afraid of the strictness of SDB? lolz.. He sounded quite serious in expressions where Geeta sounded very naughty.. But vocally, both the legends carried the song so beautifully!! 5. Shudhu Ektukhaani chaoa. Lukochuri(1958). My most most most favourite duet of Kishore-Geeta… First, thanks to Hemantda for composing such a lovely duet.. Add to that Geeta’s “chulbuli” voice with Kishoreda’s “shararat”.. Ahhh… this song is a gem on its own… A truely melodious song..
6. Ghar ki raunak hai gharwali. Bandi(1957): I like this song as again with a great chemistry, both of them complimented each ther beautifully in this funny song..
7. Aankhon mein tum dil mein tum. Half Ticket(1962): Kishore at his mad best ….. Salilda.. hats off to you.. what a comic song.. Kishore had a bit of edge over Geeta in that song though, perhaps owing to the fact that he was playing the character himself!! Loved reading this post, way to go Marcilo. Kishore kumare is a legend in our film industaries b’coze he is imrotal singer in wolrd.I can’t forget the kishore’s memorable songs.He was a actuly singer.nobody can beat him.I m a big fan of kishore kumar.love u kishore da. You are probably right about the effects of singing, it made hell of a difference. That is what made us love those old songs. Also, do not forget Shararat’s Dekh aasman pe chand muskuraye. A lovely lovely duet from SJ. Thanks for the write up, though. Nice article on two great singers.Kishoreda is an idol for millions and he is immortal.